• Back From The Dead: California administrators try to eliminate baseball program in fall of 2010, but boosters raise $10 million to save it with another $25 million coming. 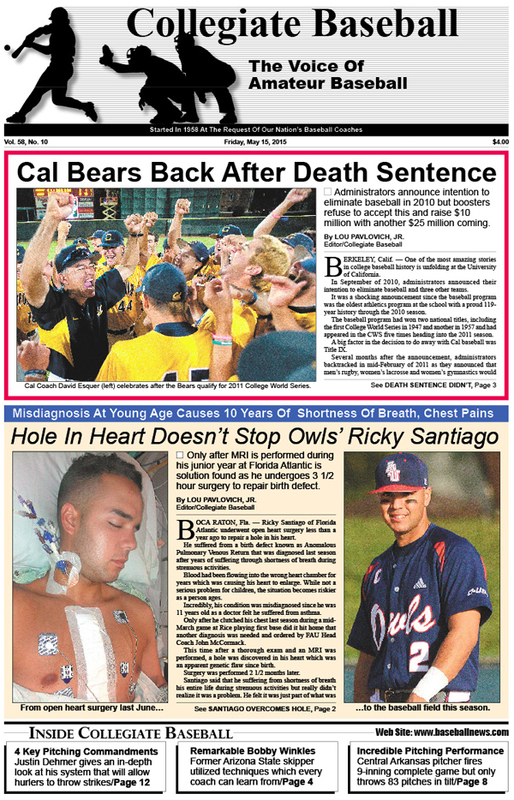 • Incredible Story Of Ricky Santiago: Florida Atlantic third baseman suffers from years of chest pains, shortness of breath due to hole in heart after misdiagnosis at a young age. • Amazing Bobby Winkles: Former Arizona State skipper taught many life lessons as he led Sun Devils to 3 national championships. • Pitching Duel For Ages: Arizona, Washington State lock up in remarkable contest that goes 10 innings without a run and finally ends on an unfortunate error. • NAIA Notes: Missouri Baptist pitcher Dave Mullins tosses a perfect game against William Woods with 7 strikeouts. • 1,000 Wins: Spring Arbor Coach Sam Riggleman celebrates special accomplishment. • NCAA Division 1 Notes: RHP Connor Gilmore of Central Arkansas fires 83-pitch, 9-inning complete game as he averages 2.5 pitches per batter while LHP Tyler Wilson of Rhode Island tosses 85 pitch gem. • 21 Strikeouts: RHP Alex Robinett of Army strikes out school and Patriot League record 21 batters against Air Force during 9-inning complete game win. • Collegiate Baseball’s National High School Top 30 Poll: Parkview H.S. (Lilburn, GA) No. 1 with 18 consecutive wins. • High School Notes: Los Angeles Unified School District reviews the low pay coaches receive. • Ruleball With Rich Marazzi: Rich answers questions from readers that feature the sublime to ridiculous. • Justin Dehmer: Four pitching commandments make a huge difference for hurlers. • Junior College Notes: Yuba College ends 24-year-drought to qualify for California State playoffs. • NCAA Division 2 Notes: Ryan Uhl of Indiana University of Pennsylvania belts 29 home runs with 75 RBI which is amazing when you realize he only hit 1 home run last season. • NCAA Division 3 Notes: Josh Outsen of St. Joseph’s College tosses a perfect game with 12 strikeouts. • Brian Cain Column: Commitment to excellence is at core of Ben Orloff. • Tom Kovic: NCAA Manual is a must resource for prospects. • Charlie Greene Column: Throwing across your body can spell big trouble. To purchase the May 15, 2015 edition of Collegiate Baseball, CLICK HERE.